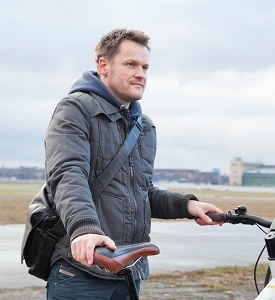 Ahead of A2B’s appearance at Spin London (8th-10th May at The Sorting Office) we caught up with award-winning e-Bike designer Norbert Haller for a chat about design, tech and cycling: three things that define Spin London. How and why did you become a designer? My passion for bicycles goes back to the mid-1980’s when I started racing BMX and MTB bikes. This gave me the bug and I wanted to find a way to put that passion into a career, and as I love design and technical products, I decided to study transportation design to turn my hobby into a job. My early experience and style has gone on to influence the A2B e-bike designs in that the long-distance, full suspension and small wheels give a bit of a mountain bike/BMX/motocross look and feel. I also have a passion for classic motorcycles like the old Indians, Harleys and Vespa scooters. Their upright riding position, unhidden technology and artful workmanship have influenced the ergonomics of the A2B range and the attention to small details. Is there a designer who particularly inspired you? Robert Eggert, Specialized’s Creative Director. He has worked at Specialized since 1987, and in that time has created some really interesting concept bikes. Is there something about the design of A2B e-Bikes you are particularly proud of? A2B was one of the first e-Bike companies in the world. We led the market with innovative, award winning designs and smart technical solutions. I’m particularly proud to have played a part in advancing accessibility to cutting edge electric mobility. Is there anything else about A2B bikes that Spin visitors should know? Two of our models have completed the US ‘Coast to Coast’ cross-country challenge in record time as well as the ‘End to End’ in the UK (Land End to John O’Groats) with nothing more than a single puncture. What impact will e-Bikes have on the market: in 20 years time will everyone be riding them? e-Bikes and light electric vehicles will play a big part in the future of transportation. Increasingly we will see all types of vehicles powered by low emission, electric motors. Batteries will become more efficient in future and we will see charging infrastructures coming into cities. Not only a sustainable alternative mode of transport but fun as well. What is the next big innovation in the cycling industry that we should look out for? As the digital world steps into the bike world, electronics will offer new functions and possibilities for all types of bike. Now we are seeing electric shifting, electronic controlled suspension, smartphone applications for bikes but most of these units have separated systems, with a controller and batteries. It’s like the early days of mobile telecoms where we had a digital camera, phone and mp3 player: now it’s all combined into one smartphone. I think we will see the same ‘all in one’ products in in the bike industry. At A2B we are ahead of the pack in launching our eSocialBike app which goes a long way towards achieving this. Visitors to Spin London will be able to see it for themselves on our stand. Aside from A2B, which exhibitor at Spin are you most interested in? Canyon and Hövding – clever and stylish. Where is your favourite place to ride a bike? In an urban environment I love Berlin – you really feel the city’s spirit by cycling through small parks and sideways in a way that’s not possible in a car or by public transport. For country/mountain terrain my favourite places are Lake Garda for the stunning scenery and Gran Canaria for good weather in winter time – and great nature.